This engraving ca. 1780 (by Jacques-Firmin Beauvarlet Abbeville 1731-Paris 1797?) is made after a painting by the French painter François-Hubert Drouais (1727-1775), or Drouais le fils, entitled "The children of the Comte Béthune playing with a dog". The original painting is (or was) in the possession of Mrs. Eugenia W. Ryan, New York. The painting may be identical with the one mentioned in Guitares Chefs-d'oeuvre des collections de France, Paris 1980 p. where it is said : "Better still, as early as 1761 Drouais (1727-1775) had painted the two sons of the Duke of Bouillon, dressed as mountaineers; the elder has an elegant guitar and holds his dog's paw to make him strum the instrument." 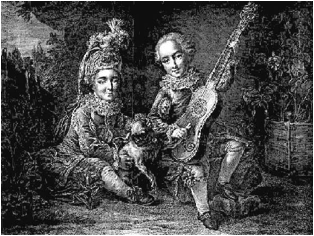 Drouais also portrayed Mme Clotilde, princesse de Piedmont playing the guitar (Musée de Versailles). The engraving is reversed, but this has been corrected here. More information about Drouais can be found in the National Gallery of Art, Washington. Another painting by Drouais can be found in the Louvre. I'm most grateful to Rudolf Henning, Württembergische Landesbibliothek, Stuttgart, who supplied me with this information.